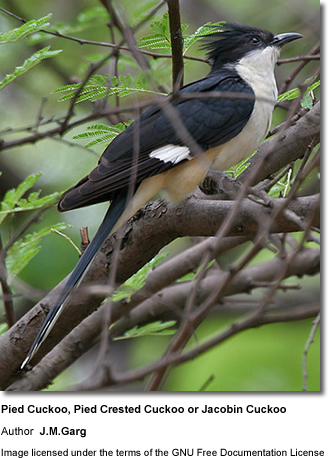 The Pied Cuckoo, Pied Crested Cuckoo, or Jacobin Cuckoo (Clamator jacobinus) is native to Africa. The Pied Cuckoos occur south of the Sahara Desert eastwards to India, Sri Lanka and Burma. They are short-distance migrants. Those breeding at northerly latitudes or higher altitudes will travel to warmer or wetter areas for the winter. They inhabit scrub, wetlands and cultivated areas. The Pied Cuckoo is a largish cuckoo averaging 13 inche (33 cm) in length. Adults have a prominent crest and a long, graduated tail. Adults of the light morph are black above with a white under plumage. Adults of the dark morph are completely black, except for a small white wing patch which occurs in both morphs. Immature birds are browner above and yellowish-white below. These brood parasites will lay their egg in the nest of other birds (mostly the Turdoides babblers), for them to raise them as their own. 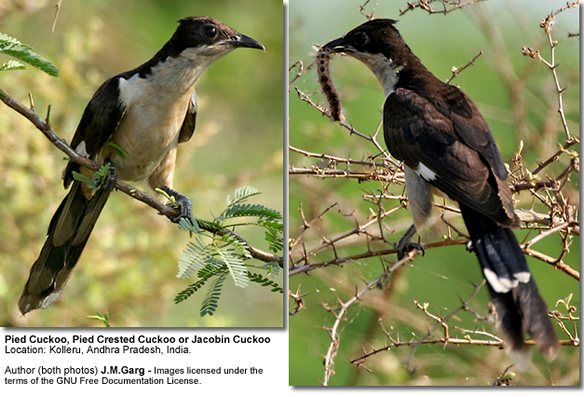 The Pied Cuckoo feed on various insects and caterpillars. This noisy species makes persistent and loud pipew pipew pipew calls.